I discovered a wonderful piece just finished by Kelly Fletcher while browsing about the net this morning. Her leaves are making my heart sing tunes from growing up days in Vermont. Each one is lovely. Please do go see. More close ups of the work here, here, here and here or simply explore her blog. Don’t miss her mom’s bullion stitches, if you do. Many thanks, Kelly, for sharing your beautiful work. I’m totally disoriented and have way too many experiments going this weekend. First the pearl stitch or the reversed Palestrina stitch. I have no idea why this stitch got my attention. I have lots of other experiments going with a raised chain stitch and another variation of the chain stitch called the petal stitch. But this pearl stitch is simple and easy to do. It will follow a curve or a sharp angle. I need to do a lot more tests with it for spacing of the stitches, types of thread to use and so forth. And the version I’m doing may be a little different from the one referenced above in SharonB’s dictionary. I looking in Mildred Ryan’s book for more raised stitches when this caught my attention. And I followed her direction, I think. So I need to look more at both examples. I also can’t find an on-line step by step on the petal stitch the way I’m doing it. So posts will be upcoming on these two stitches. And I’ve more experiments to photograph with a raised chain stitch. In the meantime, here is something I was working with at odd moments during the summer. You may click for an enlargement. Daring patterns are one of my favorite things. I wish I had the time to devote to learning more about them. Kogin is my favorite so far. And this weekend I pulled out some of my experiments with it and have been looking around the net for more supplies. Many thanks to SharonB and all other stitchers who keep wonderful on-line dictionaries available to us. I appreciate their labors in behalf of the stitching community so much. The orphan works act was hotlined and passed in the US Senate Friday. Please request those who are in the House of Representatives not to follow suit but to reject this badly written legislation that places undue burden on all US artist, photographers and many others to protect their copyrights. Please acquaint yourself with the issues involved. Here is a place to start, if you’re not already aware of them. And please, take time to inform your representative of your point of view. If you wish to read some of my previous posts on the subject, this might be the place to start. I’m outraged that under the cover of trying to address a real concern for libraries and museums there is much more going on in this legislation by those who have other interests. I’m ourtraged by the way this bill was passed in the Senate. In the midst of difficult days and the urgency of other legislation pending before the House, I still think this is a vital issue. Our representatives need to hear from us. And those outside the US may voice their concerns as well using this link for additional instruction. Thank you for your consideration of this issue. Many thanks to those who have already taken action, please do it again. And many thanks to those of you who now may speak up to help protect copyrights for visual artists here in the US. I was working and posting about a raised chain stitch of some kind last week and had gone on to another stitch, when “Tenar” at Tenar’s Cave left a comment for me. I went and viewed her sampler; it was full of variety and very interesting. It expanded my thinking on the stitch and I decided to revisit it. Sometimes a step back ends up being a step forward. You will see some of the samples below following what “Tenar” had done. The differing results, in those cases, is primarily due to the difference in ground. Many thanks to “Tenar” for this comment and her work with the chain stitch. She has recently done some lovely work with the Algerian eye stitch. Please do swing by and see it, if you haven’t already had an opportunity to view it. Well, I have more experiments but they will have to wait for another post. Next scheduled post: Monday (us, west coast). After my falling down the stairs design for the half way point in SharonB’s TIF challenge, it made me laugh when I found what Sharon had to say in her August TIF post. Her question for August was, what is balance to you? And her follow up question was, how do you balance aspects of your life? If one feel like she has just tumbled down the stairs, it should accenctuate her concern for balance. And it should be a easy design to come up with. Logical, right? The next few photos are reflections on my difficulty to find balance in life. If smarter, I’d try putting this into a video slide show. In fact, I may have to take time out and learn how to do that. I wonder if I can photoshop in a sky or if I need to stitch it. Better yet why not make several skys to indicate the passage of time. A well pruned life, the balanced life? Update: The link below is now working! Many thanks to Christine at Lady Jane’s Journal for very kindly pointing out the broken connection. If you aren’t already familiar with her blog please do swing by and acquaint yourself with it. Every quarter when Jeanine sends her notice to the EGA list to about updates at http://www.tuttoricamo.com the Italian needlework website, I say to myself, I won’t bother to mention it on my blog. Then I go see what they have put together in various pages and the downloadable antique books. I can’t help but say it is beautiful white work, please go see it. If you have special interest in hardanger (punto norvegese) or reticella, this quarterly update highlights these areas and there is much more. Click the appropriate flag but don’t hesitate from going to the middle of the Italian page where the header says “le novità in questo aggiornamento”. I only admire reticella and other needle laces but if I worked with them perhaps I’d find the lovely pages of work as instructive as beautiful. 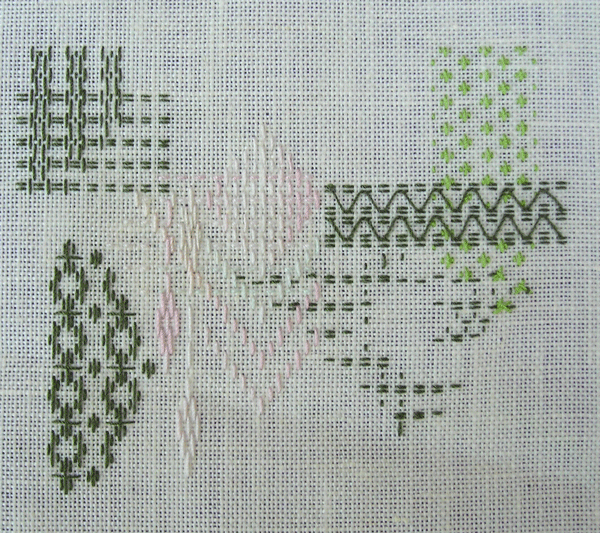 There are a variety of designs from intricate to simple that could be translated over into other needlework disciplines. As for the hardanger pages, I had my sketch book out because I was so impressed by the way I was seeing some of problem areas handled. I felt like I was staring at answers to some of my “how to” questions from older, wiser stitchers. And they were giving me new ideas about what solutions might be available. Many thanks to Jeanine in Canada and others for work in translation at that site. I’m still enjoying the rosette chain stitch. More practice has been increasing my liberty with this stitch. But there is no getting around some of the limitations inherent in the stitch. But now I see some areas that I could get more done in if I would press it. As I was out and scouting around I found two links I wanted to share. History and importance of rosette stitch in Portuguese embroidery (text only/general photo). Use of rosette stitch in various embroideriesin an pdf hosted by Sarah Bradberry at her website Embroidery and Sewing (of special note page 11). And while I was looking in on other various other interests I came across these two blogs. If you aren’t familiar with them, please do swing by and look about. Finyovisian is a blog has started to follow the book Finding Your Own Visual Language by Morgan, Benn and Dunnewold. Their first posts involve cutting paper. As regular readers know I love this type of experiment and am always on the look out for more. And Ornaments the blog of Orna Willis, I may have mentioned this blog before but I will just point to two things that have fascinated me lately. First, her post on emphasising various patterns with in one pattern by use of color. Second her 5 year Shields of Life series. 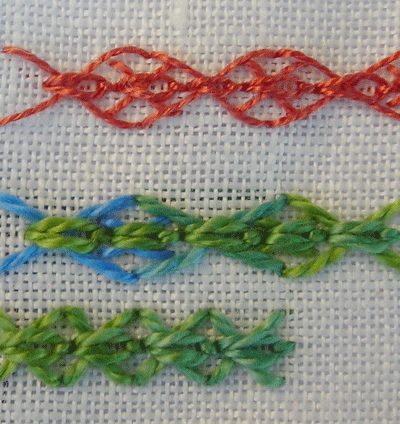 Now to turn a back toward the rosette stitch again, here are my experiments from this weekend. I ran out of the outer purple thread and now I am out of photographed samples, too. I love the look of rosette stitch. It’s a member of the chain stitch family. And it is worked from right to left. If you’re not familiar with this stitch SharonB has a step by step at the link above and Mary Corbet has a video tutorial. Many thanks to Sharon and Mary for the resources they provide to the on-line needlework community! I have been wanting to take the time to play with this stitch for some time. And a little unexpected time cropped up last evening. It is such an easy stitch but it is proving to be hard to experiment with. Exactly what I expected or feared. I got away with very little variation. The stitch fell apart when I tried to stretch the limits. So far this is the limit of my experiments. As you can see above I was fairly cautious about angling the stitch until I tried a circle. It’s not passing muster yet. With more practice perhaps it will get there. This might be a nice stitch to take “off grid”. Next planned post: Monday (us, west coast). In July Sharon b‘s question for the Take it Further challenge was, what is it to be at the half way mark? At the half way point in this calendar year, I felt like I was falling down the stairs. This is definitely not the final version. Capturing the continuing motion, the immovability of the stairs and the fragility or frailness of the human person is what I’m after. Just not achieving yet. I’m working with a new-to-me thread called Flair. It is a stretchable tubular ribbon for needlepoint according to the little card it came on. It’s nylon and more shinny than I’m happy about. But with it is sheerness I’m hoping that stitching over it or couching it may prove successful for taking the edge off a shape and showing some of the motion that I was hoping for. Because of the tubular construction another thread can be placed inside this ribbon. I’ve tried catching the back layer of it from the back of the fabric and that worked as another alternative for attaching thread to the ground. I’m full of how-to questions. If anyone has worked with this thread and has any tips or examples, please leave a comment, I would appreciate learning more. Or if you could suggest a more suitable thread, that would be great, too. Thanks very much. Next post scheduled for Friday (us, west coast). You are currently browsing the Quieter Moments blog archives for September, 2008.